CLUSTER CRYSTALS are a group of many crystal points growing together. Sharing and combining all their energies, they seem to act as a collective whole, and are a wonderful choice for clearing negative energies from any surrounding area, making them an excellent choice for practitioners of Reiki and other healing modalities. They are a terrific companion stone for those wishing to promote peace, cooperation and harmony in all aspects of their lives, whether they be of a personal or of a business nature. Clusters teach us that we should "celebrate" all of the unique characteristics that define us as individuals, and they show us the beauty and perfection of working together and complementing, instead of competing with each other. In days of old, swords and daggers were the means to defend and protect one's rights and holdings, and all whom they loved. Sometimes when a sword was created, it was empowered by its maker, giving it a persona that both defined and complemented its master. It was an "extension" of the person who wielded it. Some were named and were even believed to have been enchanted, such as "Excalibur" the famous sword of Avalon, drawn from the stone and used by King Arthur to bring peace and truth to his kingdom. It was this wonderful story that inspired us to create this unique line of Swords Of Stone jewelry. From ancient through Medieval times, and into our living history of today, the sword has been found in many races and cultures and stands strong as a symbol of justice, honor and chivalrous times. Just as Archangel Michael, St. George and Lord Arthur used their swords to put an end to evil, bringing peace and justice into their realms, so do they each challenge us now to "take up the sword" and cut through all the "darkness" in our lives to protect and defend those we love. In doing this we can open the doors to the abundance, peace and happiness that is already ours by Divine Right. With this ideal in mind, it is our hope that each of these Swords Of Stone creations find their way into the hands of those who would wield them with wisdom and compassion in the "quest" to bring total peace, love and enlightenment to Mother Earth and all her children. 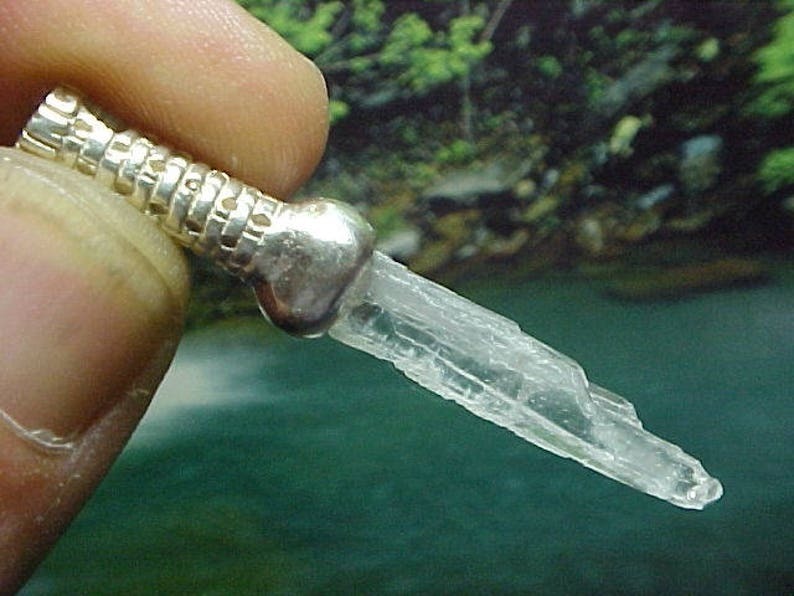 WAND CRYSTALS are long, slender crystals which are at least 4 times longer than their diameter and often have unique Etchings or Lemurian grooves on them and are believed to have been used in the Healing Temples of Atlantis and Lemuria. Sometimes having the Dow configuration of 7-3-7-3-7-3, these Crystals are a wonderful companion stone for all those who work with alternative healing methods, especially those based in ancient times, and the terminations are excellent for focusing and bringing in the energies from the stars. SILVER is a wonderful complement to those who wish to promote patience and perseverance in their lives. It is an excellent tool for giving one "the advantage" in all aspects of competition, and helps to enhance perception, and emotional and intuitive energies. Silver is a terrific choice for those who seek to bring an "eloquence" to their communication skills, and it is also the grounding mineral for those born under the sign of Aquarius.